Let’s be honest, success is hard. Not complicated, just hard. Today, I want to rewire how you think about success and teach you how to be successful in life. Well, I got news for you: NO YOU WON’T!!! The truth is success isn’t a goal or destination — it’s a MINDSET you take on to achieve your goals. And like all other mindsets, you don’t just drop it once you achieve your goals. Instead, you adopt it so you can carry it with you forever. And I’ll be honest: Success isn’t an easy feat to accomplish. It’s human nature to look for the quick fixes and get-rich-quick schemes — even though those methods are often temporary and incredibly ineffective. Only by breaking past these mental walls, can we truly become successful in life. That’s why I want to help you rewire how you think about success and help you break down these barriers once and for all. Bonus: I asked 15 of the world’s top experts to share some of the most successful tests they’ve run. Download my free 15 Little Life Hacks guide and start taking action today. We’ve seen them all before in weight loss commercials, cologne ads, and late-night infomercials. That’s because marketers know how powerful magic bullets can be. We also see magic bullets outside of advertising too. Take Dwayne “The Rock” Johnson for example. BTW, this is just The Rock warming up. When the fact of the matter is that The Rock doesn’t have a “secret” to his muscles. Hell, he’s even released his full diet and exercise regimen online and has gone on record saying he doesn’t use steroids. If they really wanted to be as big as The Rock, they’d work as hard as him too. But these people don’t want to deal with the fact that he looks the way he does because his diet and workout are INSANE. They don’t want to put in the work — they hear how he is successful at working out and immediately start looking for a shortcut. Whether you’re trying to start a business, find a job, or improve your fitness…MAGIC BULLETS DON’T EXIST. Fear of failure is a very real and incredibly debilitating barrier holding a lot of us back from winning. We don’t apply for that job because we’re sure there’s “no way” we can get it. And I don’t blame anyone for it — I’ve felt the very same fears myself before. My good friend, James Altucher, the author of Choose Yourself and a successful entrepreneur, has failed MANY times. A while back, he sat down to talk to me about this for the video below. That’s why adopting a mindset of themes helps fight that fear. To that end, we should then frame any “failure” you do encounter as a source of feedback and an avenue to succeed the next time you try. Failure is NOT a reason to give something up. It’s interesting how people fall into the paradox of guilt — and don’t even realize it’s happening. After all, how often have you talked to a friend about working out, saving money, or studying for school and heard them say something like, “Yeah, I know I really should be doing that but…” followed by some lame-brained excuse as to why they’re putting off their self-development? It’s the same with people in credit card debt — many don’t even know how much debt they have! They’d rather avoid their statements and bury their head in the sand than face the reality of how much they owe. And when you DO feel guilty, don’t run away from it. Instead, follow these four steps to overcome it. Step 1: Acknowledge the guilt. Step 2: Use the “five whys” technique. At the heart of the technique is the question “why?” The idea is that most all problems can be solved by asking “why” five times — sometimes even less — and getting to the root issue. Because I haven’t opened an investment account. Why haven’t I opened an investment account? Because I don’t even know where to start. Because I bought an investment book years ago and haven’t read it yet. Why haven’t I read it? Because it’s in a box in my basement underneath the Christmas decorations. See what happened? In less than 5 whys, we figured out how to begin solving this HUGE issue with just one step: taking the time to find a book. Now this person knows the first step to getting started with his investments. Step 3: Write it all down. Take everything from steps 1 and 2 and write it all down — your guilt, each of the whys you asked, and how you can solve everything. This will help you get a clear understanding of how your mind works when it comes to guilt and problem solving. That’s right. Once you write everything down, I want you to step back and give it some space. Because we’re HUMANS — and as humans we are naturally cognitive misers and have limited willpower. Just doing the five whys and investigating your guilt takes a lot — so just pick it up later when you’re fresh and ready to take action. I suggest setting aside some time in a day or two so you don’t keep pushing it off. Here at IWT, I’m not going to give you hundreds of vague platitudes on how you should “wake up early” or “never quit.” Give me a break. These are habits and tactics that I’ve developed over the years that have helped me find success in school, business, and relationships. And I’ll be frank: Success is hard. But it’s not complicated — and it starts with getting focused. Maybe you set a vague goal like, “I’m going to get healthy this year!” And at first, it’s exciting! But then you miss a day. That’s fine, you’ll just go tomorrow. But then tomorrow comes along and you realize that you actually have some more work you’d like to get done. By the end of the week you haven’t gone at all and your gym shorts are just collecting dust on your floor. That’s because the problem with typical goal setting is that the goals set are too broad — and you have no idea where to start. So when you set a goal like, “I want to get healthy,” you end up spinning your wheels. That’s why I’m a big proponent of SMART objectives. SMART stands for specific, measurable, attainable, relevant, and time-oriented. And with each element in SMART objectives, you’re going to want to ask yourself a set of questions that’ll help you develop a winning goal. Specific. What will my goal achieve? What is the precise outcome I’m looking for? Measurable. How will I know when I’ve accomplished the goal? What does success look like? Relevant. Why am I doing this? Do I really WANT to do this? Is it a priority in my life right now? Time-oriented. What is the deadline? Will I know in a few weeks if I’m on the right track? Do you see how much better the SMART objective is than just vague goal setting? A few years ago, when I was feeling overwhelmed. I was in the middle of writing my book, building my business, and was running around like a chicken with its head cut off. The question made me nervous so I didn’t want to answer. I was afraid if I said my single most important goal, I’d be closing doors to all of my other goals — which were many. There it was. We hate giving ourselves constraints because it feels limiting. It feels like we’re giving something up, and that’s exactly what it felt like in that moment. However, it’s also freeing at the same time. Once I actually said out loud that I wanted to become a New York Times bestselling author, it became crystal clear what I needed to do in order to achieve my goal. I focused all of my attention on those things. If you want to become successful — in any area of your life — you have to have that kind of focus. Here’s an excerpt from an interview I did with my longtime friend Noah Kagan. He’s the one who called me out. Noah is a master at helping people (and himself) get laser-focused on their goals. Pay special attention at 3:53 where he talks about the strategy that he learned from Mark Zuckerberg that has brought him success. Bonus: If you want to stop making excuses and break yourself out of a rut, download my Ultimate Guide to Habits. Sometimes, the right path isn’t always clear. That’s due to the HUGE amount of choice we have when it comes to our decisions. Should you choose the well-paying job with the Fortune 100 company…or work for that start-up that might not be around in 18 months? Should you go back to school for an MBA or study online? Should you move to a bigger city or stay where you are, where you have some contacts and friends already? Though the great variety of choices might seem good — after all, you have more to choose from — it can actually hinder your ability to make a decision. To overcome this “paradox of choice,” you simply need to find someone who’s been there already: a mentor. This is going to be a person who’s going to help you through the tough decisions and guide you on the path to success. A while back, I flew to LA just to visit my mentor Jay Abraham for advice on strategy. Years ago, after I bought his book, Getting Everything You Can Out of All You’ve Got, I heard he was launching a program for small-business owners. So I applied. After he checked my references and read my application, he offered me a spot. The program was ~$25,000. And I also had to fly from NYC to LA every month for 15 months just to get 45 minutes of his time. And I would do it again — for TEN TIMES the price. It can be someone as close to you already as a friend or family member — you can even find a mentor in someone you NEVER meet face-to-face through books or blogs you read. Do you want to start getting fit? Maybe you have a buddy who always goes to the gym and runs marathons. Do you want to ace that class next semester? Talk to the professor and schedule office hours to discuss the material. If you find someone you really admire and believe can help you on your journey to success, reach out to them. Luckily, I’m going to tell you the 3 steps to an email sure to get your mentor’s attention. That’s right. It’s steps within steps.This is stepception. Step 1: Focus on them. The person you’re trying to reach is probably very busy — that’s why you need to give them a reason to open the email. To this end, you need to make sure your subject line is engaging and your opening pulls them in. Check out the opening of this email I got from one of my readers — it’s one of my favorites! That’s probably my favorite subject line of all time. “I want to work for you for free.” That would be music to anyone’s ears. But, do you see what he did? Not only did he give me a genuine compliment but told me about the results my work had on him. I LOVE it. Step 2: Make them care. You need to establish rapport as quickly as possible. If you can, name drop someone you have in common with them. In most cases though, you’ll need to establish common ground another way. For this email, my reader already knew I was looking for talented developers — so he told me who he is and why I should care. This means you’re going to have to do your homework. He knew from reading my site and my job postings that I was looking for a new developer, and he knew I liked to work fast and iterate quickly — all things he addressed in his email right away. Get inside your mentor’s head. What can you do for them that’ll make their lives easier? This means proactively asking to set up a meeting or a Skype call. Be sure to make clear that you’ll rearrange your schedule for the conversation — any time works for you. After all, you’re asking for their help — not the other way around. Check out what my reader did. He knew I had a few projects I wanted to do — but hadn’t made the time for them yet. Don’t focus on getting paid. You want to optimize for learning, and make sure that the mentor knows this. If they offer to pay you for work, that’s fine, but certainly don’t ask for this up front. If you feel like you’re not getting a valuable experience, don’t feel like you have to keep the relationship going. Don’t just disappear and not return their calls and emails. But certainly don’t waste either of your valuable time. Communicate your feelings and move on. Remember the “magic bullets” I talked about at the beginning of the article? Well, mastery is the antithesis of magic bullets. And he had an interesting point. It’s just like when we pick up a fitness magazine and want to be the guy with the huge biceps and 12-pack abs. That’s because we often focus too much on the RESULTS rather than the WORK. And that’s where true success lies: in the work that you put in. We’d all love to have a nice body or have a career that we love — but are we willing to put in the sweat equity for it? So when we hear about someone who wants a shortcut or magic bullet for results, you can rest assured that they won’t be the people who’ll be succeeding 5 years from now. But when you see someone who’s willing to work hard towards their goal the RIGHT way, you can bet they’ll be successful. 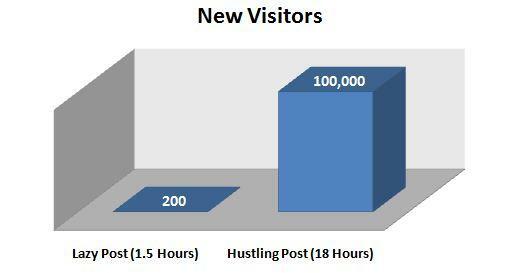 A few years ago I was testing the benefits of writing guest posts for a few other high traffic sites. In one test, I wrote a post quickly — taking about 1.5 hours to write it. It turned out fine and got me a few hundred visitors. In another test, I spent 18 hours writing an awesomely detailed post, including case studies, a video, and concrete examples. I spent 12x the amount of time writing the good one — but I got 250x the results. Imagine being able to systematically focus on doing just 10 high-impact actions a year. How do you think your results would compare to someone doing 100 different things? This is called disproportionate impact — and it’s not simple. Most people have an ordinary impact in the world. They lead ordinary jobs, spend and save ordinary amounts of money, and when they work they affect an ordinary number of people. Most people are just ordinary. What most people do: Wing it. They make a list of the reasons why they should get a raise — why they DESERVE it — and then they practice what they’re going to say in their heads a few times. They think the fact that they’ve done great work will be enough. What SUCCESSFUL people do: They study salary negotiation, the mistakes most people make when trying to negotiate, and how to crack the negotiation code. They make a list of all the reasons they’ve EARNED a raise and they create a strategy for addressing the objections their boss might throw at them. Then they rehearse their pitch 100 times. They practice in front of a mirror, with their friends, and with strangers on the street. And they get results like Andrew who doubled his salary to nearly six figures. What SUCCESSFUL people do: Commit to running 5 minutes a day EVERY day for the first week. Then 10 minutes EVERY day the next week. And so on. At the end of three months they’re running 60 minutes a day, in addition to the activity they’re doing during their work breaks, which could add up to an additional 6-8 miles a day. At that point, running has become such a habit that they can create whatever training plan they need to get to the finish line. Sure, it’s easier to do just enough to get by. To do what you’re used to doing. But if you seek out opportunities to create phenomenal returns and ramp up the quality of your work, success will come easier than you think. Combine that with relentless focus toward your primary goal, and you’ll be unstoppable. Success isn’t about being catapulted into the stratosphere overnight. It’s about taking consistent action, testing different options, and seeing the results. I’ve laid out a plan for how you can be successful, but you have to work on it every day like The Rock’s muscles. In fact, you can start implementing some life-changing tactics in your life TODAY. Here’s how: I asked 15 of the world’s top experts — people like Neil Patel, Noah Kagan, BJ Fogg and Josh Kaufman — to share some of the best tests they’ve run. These are the exact tests that’ve helped them become wildly successful. And I put them together in this free guide for you. It covers everything from how to be more productive, how to get into better shape, and how to generating explosive growth in your business and career. Grab your free copy of "15 Little Life Hacks That Can Change Your Life"